The vibrant design of Menlyn Learning Hub within Menlo Park, Pretoria, has been carefully matched with durable, aesthetically prominent products, among them Corobrik’s latest range of 65mm graphite pavers. This contemporary, five-storey educational facility - completed in July 2016 - was developed by Feenstra Group who were looking to create an immersive learning environment with capacity to accommodate 2 500 students, with plans to eventually extend for a further 5 500 students at a later stage. To realise their vision of a ‘vibrant and flexible’ facility which conserved the existing green spaces, Feenstra approached architectural firm, Boogertman + Partners, to create the flagship campus in the established Menlo Park neighbourhood. Aimed at increasing the tertiary educational opportunities within the City of Tshwane, the Learning Hub was developed on an old sports’ ground owned by the Nuwe Hoop School. The site is positioned between the man-made suburban area and a natural river system with the building reconnecting these divided areas. The 23 012m² development includes administration blocks, a canteen area, external piazza seating area, lecture rooms and a library. It is modern and dynamic in design, suited to the lifestyle of students and educational staff. “Corobrik’s premium range of graphite pavers has proven to be immensely popular across the board and the incorporation of this product into the Menlyn Learning Hub is an exceptionally stunning example of the impact this product can have on the overall appearance of a building,” explained Corobrik’s commercial director, Musa Shangase. The graphite paver is straight-edged, producing a crisp, modern finish that complements everything from inner-city developments to educational facilities such as this. The unique colour of the paver, which is a subtle combination earthy browns and muted reds, means the paver can be matched with a vast array of building products that either make this the focal point or allow it to draw the eye towards the building’s design. 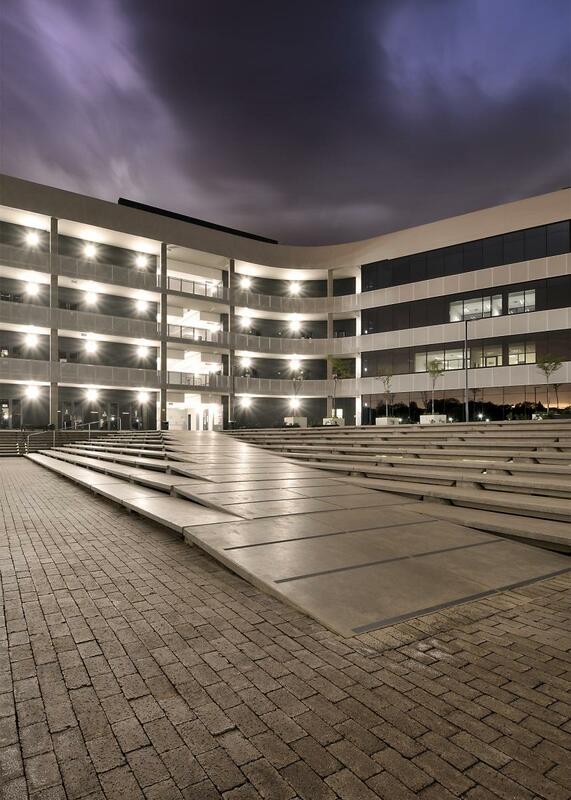 The 71 500 Corobrik graphite pavers were used throughout the development, on the piazza seating area, along walkways, as well as around the building’s perimeter. The graphite was selected, in part, because of the colour contrast created against the concrete pavers also used in the development. Another reason was the inherent durability that is synonymous with all Corobrik’s clay paver ranges. Investing in education means that long-term costs need to be kept to a minimum which is why Corobrik’s clay pavers remain a popular choice for developers in both the private and public education sector. Despite constant weathering, the graphite pavers will exude that refreshing look because of the colour-fastness of the clay and consistency of colour throughout the full depth of the brick. There was an overriding need for the design of Menlyn Learning Hub to tie into the natural environment. This meant the use of indigenous planting and permeable paving in the form of Corobrik’s clay pavers, to allow water to penetrate the surface, replenishing groundwater below.